Posted 8:53 am by Patrick Iversen & filed under Events, Featured. UNT Libraries and UNT associate history professor Andrew Torget kicked off the fall semester with a record-setting marathon to raise funds for the Portal to Texas History. With an assist from the Portal to Texas History, UNT Libraries and UNT associate history professor Andrew Torget kicked off the fall semester with a record-setting marathon. A marathon of a different sort, however: beginning on Friday, August 24, Dr. Torget ran through more than 10,000 years of Texas history during an attempt to set a Guinness World Record for the longest history lesson. 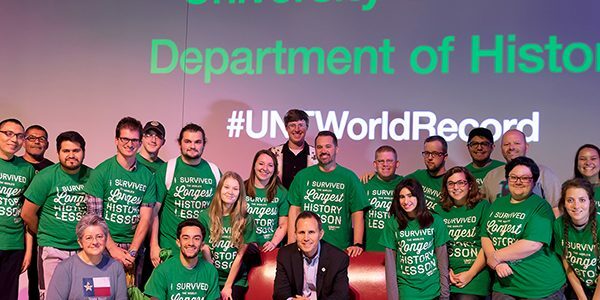 Over the course of 26 hours and 33 minutes, Dr. Torget and a team of library employees, videographers, and impartial official witnesses managed to set and surpass the 24-hour world record. It was a multi-department effort over a year in the making. Posted 12:44 pm by Jake Mangum & filed under General.